We have ourselves witnessed in some cities water being rationed and residents lining up at communal water points to collect their daily allotment. At other places water is trucked daily by tractors over several miles to make it available to residents of parched areas. What is happening is not an outlier .This dystopian situation could happen to any of us, too. India’s peculiar demographics make the water equation quite problematic. The country is home to nearly a sixth of the world’s population but has only 2.4 percent of the world surface and gets only four percent of the Earth’s fresh water. 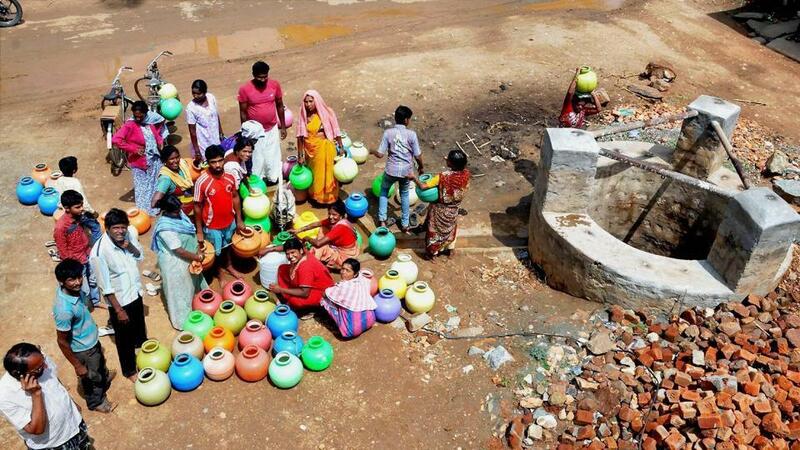 More than half of the country faces high water scarcity. Out of the 1.2 billion people living in the country, about 742 million live and farm in agricultural heartlands. Rainfall accounts for 68% recharge to ground water, and the share of other resources, such as canal seepage, return flow from irrigation, recharge from tanks, ponds and water conservation structures taken together is 32%. Israel has been a role model for the world in matters of water management with its t major innovation of drip irrigation .The country has also set the template for reusing wastewater in irrigation. It treats 80% of its domestic wastewater, which is recycled and constitutes nearly 50% of the total water used for agriculture. Israel now saves as candlelight for countries like India. The Earth appears a blue planet form distant Space, but only 2.5 percent of its water is fresh. “Water is the primary principle of all things,” the philosopher Thales of Miletus wrote in the 6th century BC. More than two-and-a-half thousand years later, on July 28, 2010, the United Nations felt it was necessary to define access to water as a human right. The response demonstrated the world body’s desperation with the crisis . Ancient Indians understood the art of water governance. Kautilya’s Arthashastra, written around 300 BC, has details of how tanks and canals must be built and managed. The key was to clarify the enabling role of the state, the king, and the management role of local communities. The Kings did not have armies of engineers; they provided fiscal incentives to communities and individuals who built water systems.The British upset this traditional norm by vesting the resource with the state and creating large bureaucracies for management.